Tasting Notes: Hibiscus and pomegranate were made for each other! Tart with floral highlights – a cleansing and highly refreshing cup. Ingredients: Luxury green tea, natural dried hibiscus, natural pomegranate. Our Green Tea blend is a tart combination of pomegranate and hibiscus. It is believed that the first instance of mixing dried hibiscus petals and pomegranate took place on Easter Island by Polynesian migrants. When pomegranate reached the island, the natives were intrigued, and soon after, the pomegranate juice was blended with the plentiful hibiscus petals. 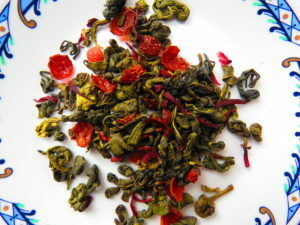 This delicious naturally flavoured tea is created using a Hunan Sencha style green tea. The cup offers a sweet, bright nose, with supple notes of honey, herbs and berries offset by grassy notes of moss from the green tea and a smooth palate cleanser of a finish. Put simply – a fabulous cup worthy of a tall-tale or two of its own. This tea is based on a Sencha style green tea from Hunan. Interestingly, both green and black teas can be produced from the same bushes. During manufacture, the freshly plucked leaves are immediately steamed and then bruised by hand. Next the leaf is pan-fired, a process that imparts a distinctive glossy look and feel, and dried. Unscented Senchas typically have dark green, needle shaped leaves and produce a pale green to yellow, very bright and smooth cup with a sweetish, honey like finish.